The RS has no trouble distinguishing herself from her simpler sibling. She wears a massive fixed wing spoiler that instantly highlights her intentions. Then there are the additional ornaments like the splitter, the diffuser and a larger single-price grille with a deep lower lip flaunting the 'quattro' insignia. She also flaunts her new taillights which get wafer-thin OLED detailing. 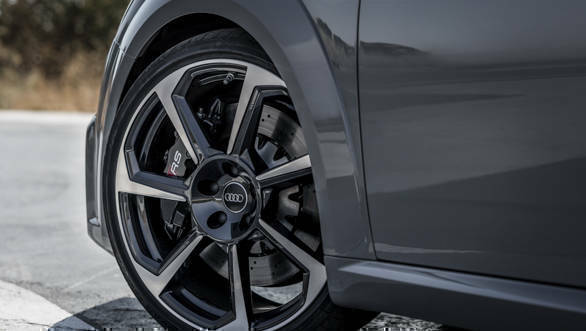 The RS wears different footwear too, comprising of larger wheels that have a very similar design to the signature wheels on the previous TT RS, but without the jazzier two-tone finish. 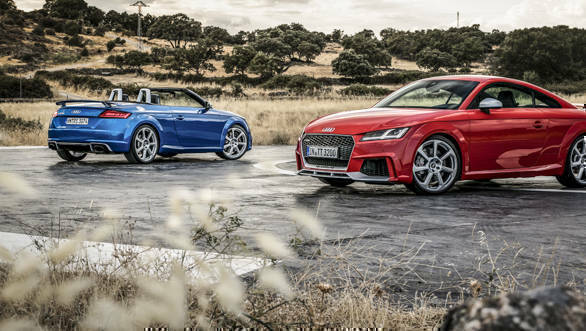 Audi sold over 7,000 units of the previous TT RS and expects to sell a lot more of the new Mk II and it isn't difficult to see why. With the handsome new design, the boffins from Ingolstadt have also gifted this car with power. Lots of it. You will get the first hint of it the moment you slide into the cabin. 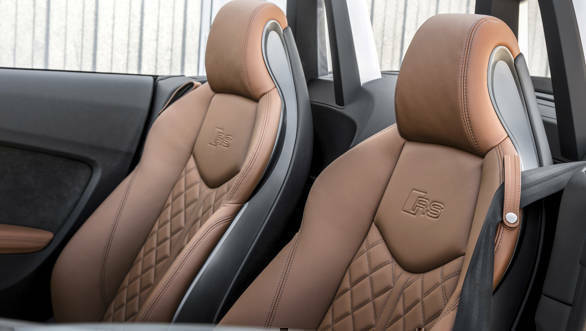 There is plenty of motorsport inspiration going on in there - a flat-bottom wheel like the R8 with racecar-like satellite switches on it, paddle shifters, alcantara and carbonfibre inserts and the quilted leather upholstery, which I have instantly taken a liking to. Unlike its rivals, the TT RS also has a tiny bit of space at the back for two kids to join you on your drive. But the overall space of the cabin isn't very roomy and is a nod to the TT's compact size. The motorsport connection is highlighted further as you crank up the engine. It comes to life with an uncanny rumble typical to an unbalanced, five-cylinder engine. Audi decided to stick to this configuration (and we are elated) because of the importance of five pot mills in Audi's rich motorsport history. Like the previous five cylinder engine that it's replaces, this one too is a 2.5-litre unit. It's claim to fame though is that it puts out an unbelievable 400PS of power - that's not only more than its immediate rival, the SLC 43 AMG, but also more powerful than the Cayman and Boxster! The engine is all new and using a mix of magnesium and aluminum components, it shaves off 26kg over its predecessor, aiding weight distribution. 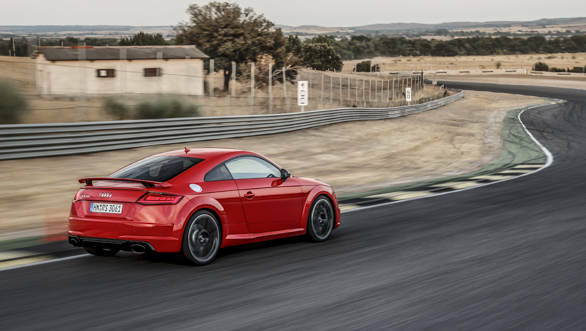 Like Porsche, the TT RS too gets a simple launch control function. So as long as you have enough strength in your feet to bury the pedals as intended, you will not have trouble getting close to this cars claimed sprint time - 3.7s from standstill to 100! That's about a blink of the eye slower to the ton than a R8 which sports double the cylinder count. The RS' acceleration also feels a lot more ferocious and this is an aggressive little car and won't think twice before shoving your head into the seat to get those figures. Audi is quick to point out that the torque vectoring for the launch control has been tuned to minimize load on the clutch, so don't worry about the clutch wear. A new turbocharger now helps extract 480Nm of torque that is spread across 1000-5,850rpm in a rather flat manner and up to 200Nm can be sent to the rear wheels at any given time. So while the outright acceleration is dramatic, the TT RS is quite well mannered around corners - where you ride the meaty torque wave and use the massive power to power out of the bends. You had to see how it catapults out of Jarama's corkscrew! Between 5,500-7,500rpm, the power curve is flat meaning the RS is even more charming at the limit. 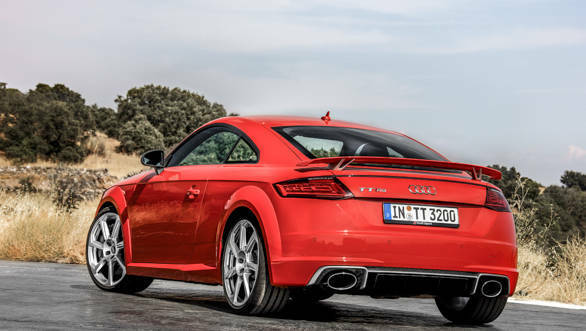 The beauty of the TT RS is, you can actually push the car to its limits and it doesn't get provoked easily either. It is a little twitchy around switchbacks, but the quattro system provides excellent grip as expected. More importantly, unlike other RS models like the RS6 or RS7, this car doesn't have a juddery understeer when you start pushing it hard. It feels like a proper sportscar around the track and not some leisure car on steroids. All that power, therefore, feels usable. 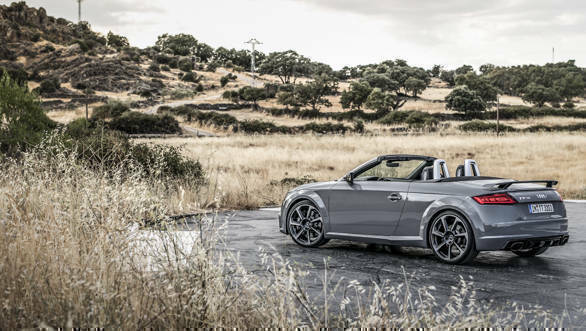 After half a day at the track, I also managed to get my hands on the TT RS roadster around the Spanish countryside. It fit in well on the narrow B-roads, while the loud sports exhaust had kids running behind the car in joy as I passed through some of the hamlets. With the weather being kind, I didn't have to think twice before dropping its fabric top. The fabric top - that is only reason why I wouldn't buy the roadster in India. Out on the highway, the open top does make for plenty of the wind-in-your-hair experience, however, it can get annoying past 100kmph. I have experienced better wind deflection with the other convertibles in this category. 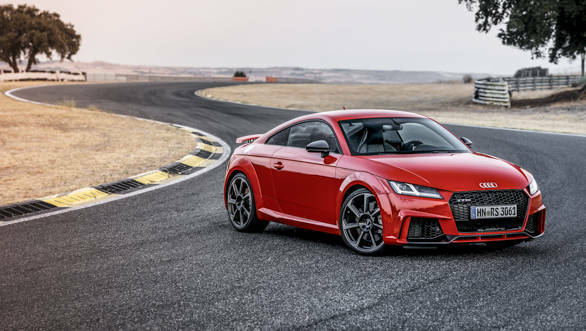 The TT RS' suspension comes with optional magnetic dampers and on the racetrack they were an absolute delight - making for those amazing handling dynamics. On the road though, they are a bit firm. So if this is going to be your toy for the twisties, then soften the blow with the 19-inch rims instead of the 20s. That said, it still offers a more plush ride than the SLC 43 that I recently drove, Read our review here. Even the engine note is so much better than the AMG V6. It's an absolute delight with the roadster as it adds more dynamism to the open top motoring. 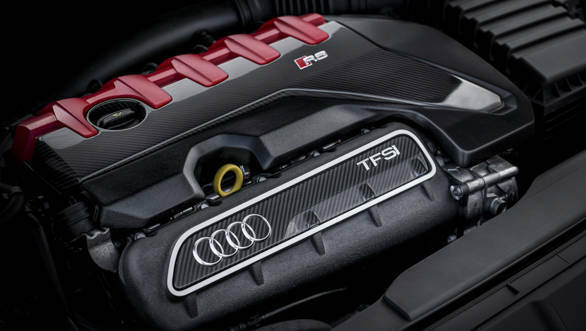 The distinctive exhaust is the other reason why Audi stuck to the five-cylinder configuration. Unfortunately though, you don't the option of a stick-shift with this new setup. It would have been an absolute delight in this explosive package. The seven-speed dual clutch automatic that it ships with isn't a disappointment though. Its quick, predictive and comes with the handy paddle shifters. The brisk performance of the engine and gearbox is complemented by the steering, which is typically light yet precise like most Audi models. 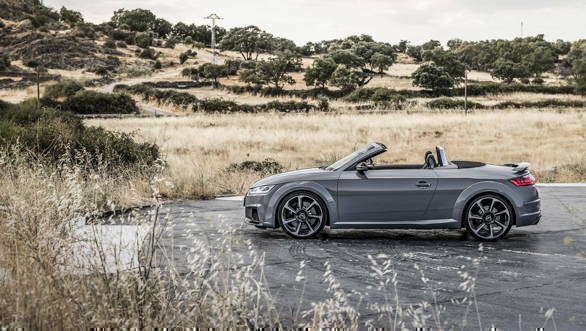 So as a package, it all comes together to make the TT RS a perky little dynamite and something that you can take more seriously than you otherwise would with the base TT. The fly in the ointment however, could be the price. 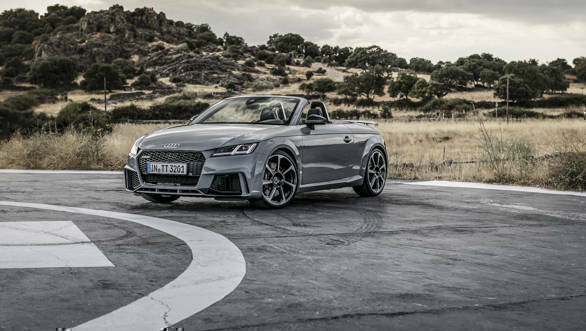 Just days before we drove this car, Audi opened the order books for the TT RS in Europe and it's base price is higher than the starting price for Porsche Boxster and Cayman. Yes, it has been gifted with a lot of equipment and lot more of power. But you see, gifts can be tricky. Gift someone with unimaginable power and they may think they are meant to rule the world. 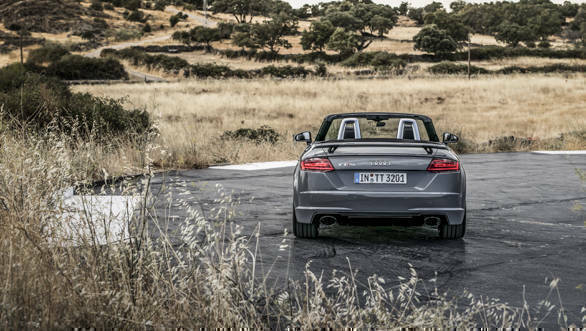 This car's world however, is dominated by the Cayman and Boxster twins and rivaling their almost magical drive is a steep and probably impossible task for the TT RS. We will find out, when they all land in India. But for now, lets celebrate the fact that the lovely five-cylinder motor lives on and that it could play its symphony in India, soon.